When it is too hot to cook or BBQ I will make a salad night dinner or meatless dinner. The meal will usually consist of two or three salads along with bread or buns. If there is any cooking preparation to be done for the salads, I will do this early in the morning before the heat of the day sets in. Of course these salads can be eaten anytime of year. 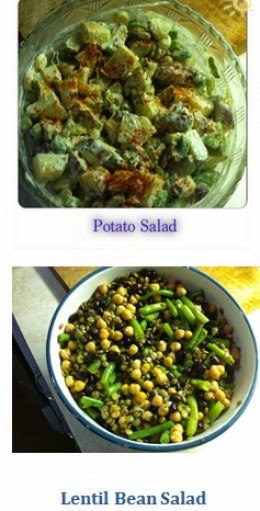 There are a zillion ways to make a potato salad and everyone has their own way of preparing it. Not very often do I make this salad the same way twice. The spices I use usually stay the same, but the ingredients change as to what I have in the house or what I remember to buy at the grocery store. Boil the potatoes until they are fork tender. Drain and rinse under cold water. Once cooled either set in the fridge to make later in the day or chop into cubed or bite sized pieces and put into a large bowl. I leave the skin on the potatoes but that's just my preference. Chop veggies, hard boiled eggs, and add to the potatoes. Add garlic powder, fresh ground pepper, celery seed and toss. Add relish and mustard and toss again. Since I make this during the day I usually wait until I am just about to serve before adding the mayonnaise. Once the mayonnaise is added I will mix the salad and sprinkle paprika on top. Serve & Enjoy! In a medium size pot bring 4 cups of water to a boil. Add lentils and cook for 15 - 20 minutes. Drain and rinse under cold water. Put into a large serving bowl and set aside.. Boil green beans in water for 5-7 minutes. Drain and rinse under cold water. Set aside to cool. Once they are cool enough to handle cut into bite sized pieces. Add them to the bowl of lentils. Add black beans, chick peas, and gently toss. In a medium sized bowl or measuring cup whisk all salad dressing ingredients together. Pour over the lentil bean salad, gently tossing and making sure everything gets well coated. Cover and refrigerate for one hour. When ready to serve gently toss again. Enjoy!